On this screenshot you can see cubemaps linked offline to several objects (the red lines). Lighting seams occur on the ground when parts of the ground are assign to different cubemap. This is obvious in this screenshot because the lighting is high frequency. Another problem is that you need to split a mesh into several parts when it is shared by two different environments, which is common for objects like walls and floors. It adds production constraints on meshes. Note that nearest cubemap is not always the right choice. Visibility should be test in some case. If a cubemap is intended for NPCs or the player, the env_cubemap should be placed at head-height above the ground. This way, the cubemap will most accurately represent the world from the perspective of a standing creature. If a cubemap is intended for static world geometry, the env_cubemap should be a fair distance away from all brush surfaces. A different cubemap should be taken in each area of distinct of visual contrast. A hallway with bright yellow light will need its own env_cubemap, especially if it is next to a room with low blue light. Without two env_cubemap entities, reflections and specular highlights will seem incorrect on entities and world geometry in one of the areas. The other problem is that you need to track which cubemap affect dynamics object. As dynamic object can swap their cubemap, there is popping. 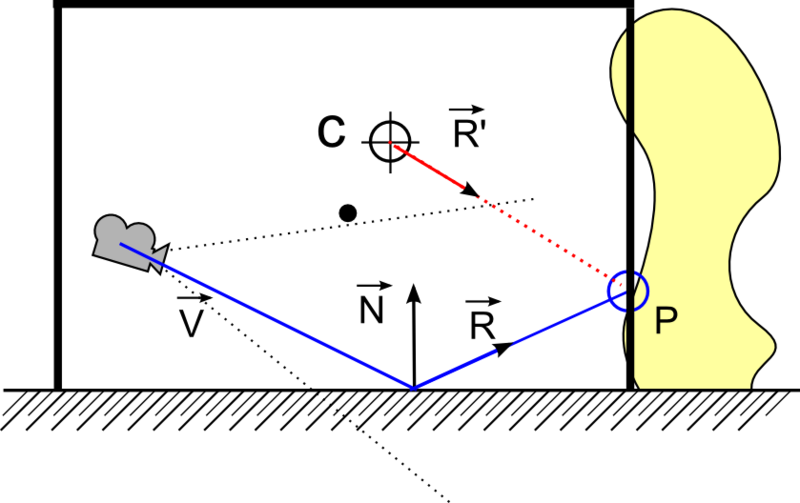 Popping can be reduced by blending the K nearest cubemap of the dynamic object. This is rather an expensive solution, you can blend the K cubemaps in the shader, adding a lot of instruction and fetch. But even blending K nearest cubemap will not prevent the popping induce by switching the smallest contributing cubemap when there is more than K cubemaps present. An infinite cubemap is assigned for each zone of the level. When the camera enters in a zone, the infinite cubemap from the zone is applied on all objects. Killzone 2/3, Call of duty: black ops, Prey 2 for sample use this method . This method is simple to implement and fit with any engine architecture. There are no lighting seams between objects as the same cubemap is used for all objects and cubemaps need to be blend between zones to avoid popping. Cubemap can be blended efficiently on CPU/GPU or in a deferred way with the 2 cubemaps processed at the same time. All objects used a global (infinite in this case) cubemap by default. Some local cubemap are placed into the level with no overlapping range. When the camera or the player reaches the range of a local cubemap, all objects used this local cubemap instead of the global cubemap. This method is similar in spirit to zone based cubemap except that “zone” has not the same definition. Cubemap can be blended efficiently on CPU/GPU or in a deferred way with the 2 cubemaps processed at the same time. Frostbite engine (Battlefield 2) uses only a global cubmap for representing the skylight . I am not sure of the method used to represent outdoor (global)/indoor (local) lighting in Frosbite 2 engine (Battlefield 3) . But they use sky visibility to blend between indoor cubemap and outdoor cubemap, which look similar to this strategy. Global (infinite in this case) and local cubemap affect only objects in their range (defined by artists). Objects can be affected by several overlapped cubemap, like a global and a local cubemap. This strategy can only be implemented efficiently with a deferred or light-prepass rendering architecture. This is the method used by Cryengine 3 (Crysis 2)  . 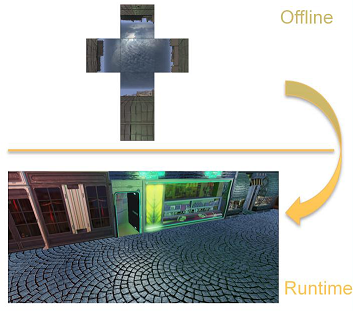 This method is simple to implement in a deferred context, the cubemap are blended in a deferred way. There can be lighting seams at the boundary of the cubemap. Several local cubemap are placed in the level. The number of local cubemap depends on the lighting complexity. Then the K-nearest cubemap of the POI are blended and the result is applied on all objects. The POI depends on the context, it can be the camera, the player or any characters in the scene. It could be a dummy location animated by a track for in game cinematic. I develop this method for a forward renderer with complex lighting scene as I can’t rely on the Global/Local overlapping method due to engine architecture constraint. 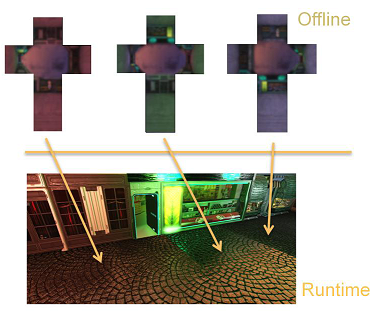 This approach has been presented in the Siggraph 2012 talk : “Local Image-based Lighting with parallax corrected cubemap”. With this method, there are no seams at all, as K cubemap are always blended. Then you always have only one cubemap applied on objects. Like for dynamic objects in the object based method, popping can appear when switching the smallest contributing cubemap when there is more than K cubemaps present (Also artists should be able to avoid it). The two main problems of this approach are the parallax issue caused by local cubemaps, which can be even worse when blending multiple cubemaps, and the inaccurate lighting on distant object; lighting accuracy decreases with distance from POI as the approximated lighting environment is done at POI. Use ambient lighting information at object position (like lightmaps or spherical harmonics) and mix it with the current cubemap contribution based on distance from POI (Similar technique are use to save memory and they are describe in the section “Reusing available cubemap” later in this post). Apply an attenuation of the specular contribution with the distance from the POI. 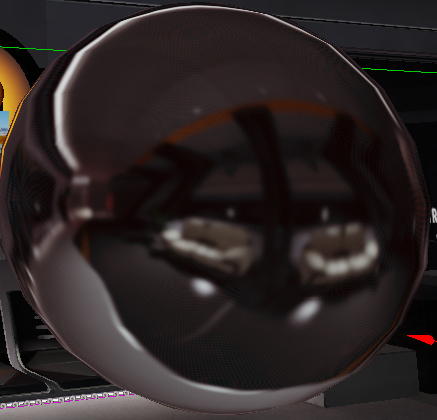 For almost mirror objects (like pure metal in the context of PBR), this can be a problem as the diffuse color will be black. In this case an option should be provide to disable the attenuation for this object and fall back to method above. Note that this can be share with share LOD technique and help with performance. Override the cubemap (See below). With all strategies, objects should be able to force the usage of a predefined cubemap. 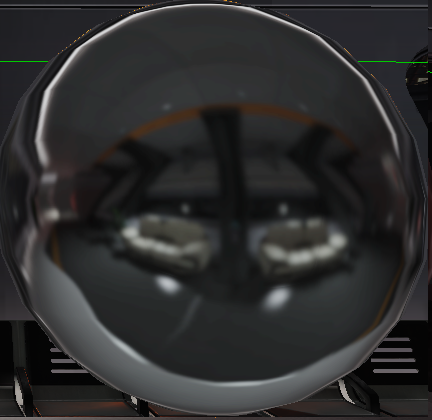 This allow to set high resolution cubemap on mirror object , fix visual artifacts with always distant mirror objects, or any other similar needs. For method based on zone (Zone based and Global and local cubemap no overlapping), the blending of cubemap could be time-based rather than zone distance-based. – With a light-prepass renderer, deferred cubemaps will not have access to the specular color term required by the Fresnel equation. – With a forward renderer, cubemaps are rendered at the same time as objects and can access all material attributes. – With a deferred renderer, cubemaps can be rendered forward at G-Buffer time (with emissive store in G-buffer) or deferred later and can access all material attributes store in G-buffer. – With deferred cubemap, we can’t access to ddx/ddy texcoord and so we can’t perform the mipmap optimization which consists to take the lesser lod between manual and hardware lod. It is possible to add some dynamic responses to lighting environment by switching on/off cubemaps. Several cubemaps must be generated under different lighting condition, and they can be switched based on context, or even blended. Having a lot of cubemaps require a lot of storage. Unlike irradiance cubemap which can be very low resolution (16x16x6 or 8x8x6) a specular cubemap is rather middle resolution (64x64x6 or 128x128x6). Higher resolution (256x256x6 or 512x512x6) may even be required for mirror objects. This section will discuss some methods to help with the memory footprint of cubemaps. The most obvious advice when talking about saving memory with textures is to implement a streaming textures system and choose an aggressive texture compression format. Streaming cubemaps is a more complicated problem than what we can think at first. The simplest strategy is to have infinite/local cubemaps link to a zone and load them with the zone. Streaming only high mipmap of cubemap when required suppose that you know when you will need it, which is not trivial and this require hardware cubemap layout knowledge. About the compression format, the cubemap should be HDR (If you generate the cubemap in game engine remember to switch off the postprocess, then you may require to not applying cubemap on objects when capturing a new cubemap). As we talk about games on DX9/XBOX360/PS3 generation, we must fit in a RGBA8bit format at most. There are few candidates : YCoCg , LogLuv, Luv, RGBE, RGBM of any kind  or Cryengine 3 RGBK (like RGBM); All are stored as DXT5 and require extra instructions. As I need a lot of cubemaps of medium quality with the less extra instructions possible, I choose the aggressive HDR format describe in . A good alternative will be to let the artists choose the compression format and to automatically default to the compression format which best fit the required range (Like RGBE for a very large range). For the aggressive format, the HDR cubemap compress to a sRGB DXT1 which is compact (half the cost of any DXT5 RGBM) and it require really few instructions to decompress. // Sample for R channel but same code for other. Compression quality depends on cubemap content and MAX_HDR_CUBEMAP_INTENSITY. I chose 8 for MAX_HDR_CUBEMAP_INTENSITY which effectively give MDR rather than HDR. The result is good enough for my needs. As a simple comparison: a 1024×1024 DXT1 texture take same memory as ten 128x128x6 DXT1 cubemap. This is perceptually closest to the right result because all channels are compress with the same value and introduce the same error, so no hue shift, however the decompression is less accurate. To sum up, compressing with three individual channel are more accurate, it better conserve luminance, but in case of high difference between maximun it cause hue shift; compressing with maximun of the three channel is less accurate but do not produce hue shift. Better is to let the control to the artists. “normalizing” the environment map (dividing it by its average value) in a pre-process, and then multiplying it by the diffuse ambient in the shader. The diffuse ambient value used should be averaged over all normal directions, in the case of spherical harmonics this would be the 0-order SH coefficient. All cubemaps must be generated in engine. At the generation time, get the diffuse ambient (as define above). When reusing the cubemap at a new location, get the new diffuse ambient then modulate cubemap by the ratio (“new diffuse ambient” / “old diffuse ambient”). This way is describe in the comment of this post by Brian Karis: With low gloss value, use the color of the lightmap * intensity of cubemap. 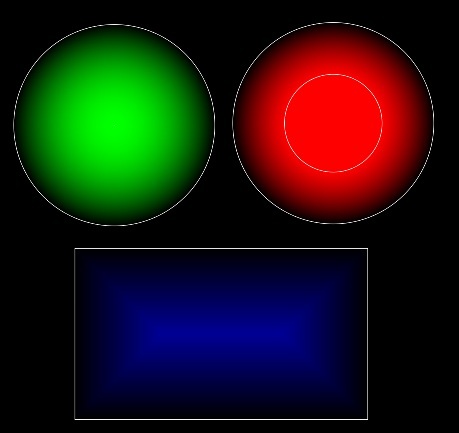 With high gloss value, it is the reverse, intensity of lightmap * color of cubemap. Both cases use a normalized cubemap and modulate. Convert cubemap to grey scale luminance, then recolorize with the diffuse ambient (average color of ambient lighting). Note that with this method, you have only one channel to store cubemap. Battlefield 3  use this kind of approach. They store some black and white cubemap in one RGBA8 cube texture (one for glass, one for weapons, etc…) and they modulate with the ambient lighting given by their dynamic radiosity system. Killzone 2  can specify a color multiplier and a desaturate factor by zone to apply on the cubemap sample (And they can multiply by SH sample too in a way similar to previous methods). The diffuse ambient is often take from SH Lightprobe or dynamic radiosity, but it can be taken by pixel from the lightmaps. All these way have similar drawbacks. They all fail with complex scene lighting consist of many different colored light. Of course, the fail is not too hard and will probably not be noticed by player, but your only choice to be fully accurate is to generate more cubemap. These ways could also be use to minimize artifact with POI-based approach. Several strategies based on local cubemap like the POI-based cubemap method require retrieving the K nearest local cubemap of the POI and blend them together. The problem of getting the K nearest cubemap is similar to the SH irradiance volume problem. Give sample of interpolation method for solving it. 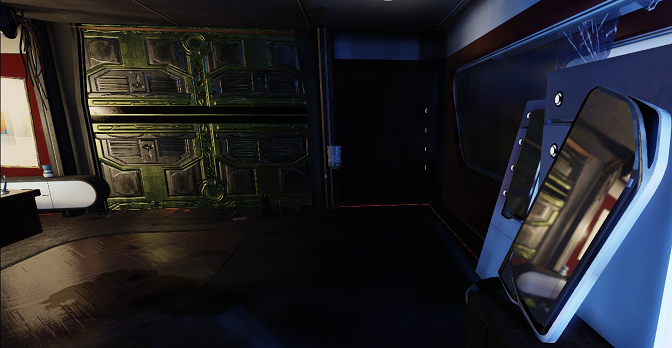 However, for specular cubemap, as you can’t have so much lightprobe in your level, simpler algorithm are preferable. I use an octree for this. The blending calculation can be trickier if you want to avoid popping and this section will describe one method I develop for local cubemaps (which mean cubemaps with a location). The algorithm aiming to work with influence volume associate to each cubemap store in an octree. This will allow gathering cubemap close to the POI efficiently. 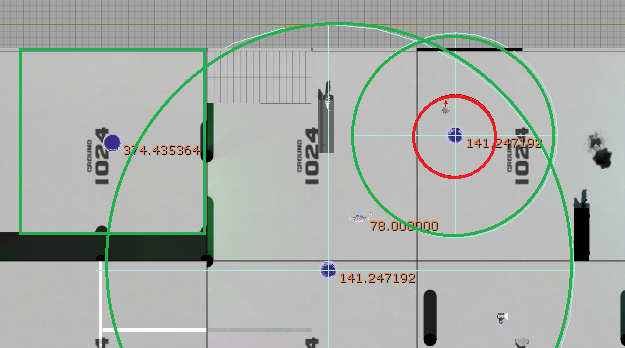 If the current POI is outside of influence volume, the cubemap will not be taken into account. This implies that for smooth transition, influence volumes must overlap. We provide artists with boxes and spheres influences volumes. Using only spheres may cause large overlap that we want to avoid. Think about several corridors in a U shape on different floors. The figure shows a top view of a toy level with 3 cubemap volumes overlapping in green. One square, two spheres. The red circle represents an inner range. When the POI is in inner range, it gets 100% contribution of the cubemap. If no inner range is defined, this is the center of the influence volume.The inner range was an artist’s request. In order to not to have any lighting pop, we define a set of rules that our algorithm must follow, including artists’ request. The cubemap will have 100% influences at boundary of an inner range and 0% at boundary of outer range. So the influence volume weights follow a pattern similar to distance fields but inversed and normalized. We also add the rule that a small volume inside another bigger volume must contribute more to the final result but should respect previous constraints. This allows artists to increase accuracy in a localized region. // Work in the upper left corner of the box. // For this we calc two weight and modulate them. // What enforce the constraint is the special case of 0 which once multiply by another value is 0. // Modulate weight0 and weight1 then renormalizing will allow to respects A and B at the same time. // The in between is not linear but give a pleasant result. // which is include in at least 2 other primitives. // As this is a rare case, we do with it. // Weight0 = normalized NDF, inverted to have 1 at center, 0 at boundary. // And as we invert, we need to divide by Num-1 to stay normalized (else sum is > 1). // and respect constraint A. The image above highlight that there is no popping with common situation and that we fully respect the rules we set. The algorithm even provides a pleasant transition. It however fails in some stressful condition we rarely met. In case you want to play with it, here is a link of the RenderMonkey project I use for generate this image: Siggraph_NormalizedDistance (This is a .pdf file as wordpress don’t support .zip file, right click and select save the link as then rename the file to .rfx after download). There is also a video showing the influence volume edition and associated debugging tools here : Local Image-based Lighting With Parallax-corrected Cubemap : Influence volume . Other more complex method like Delauney triangulation  or Voronoi diagram could be used, but I found this one simple and efficient. 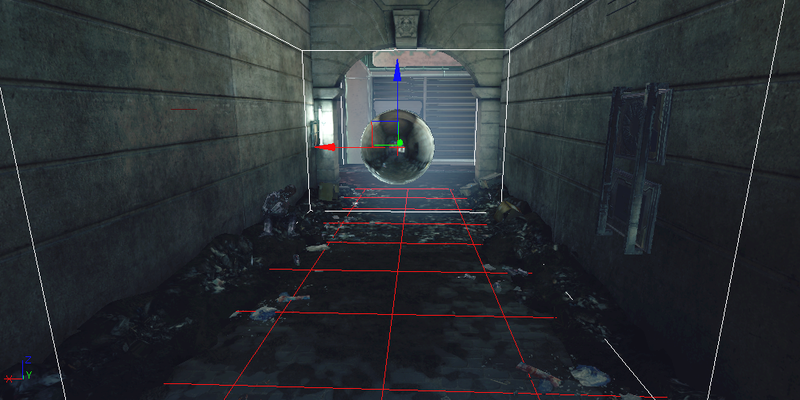 Kill zone 2 for sample used a simple distance based interpolation  for their SH lightprobe interpolation. Thanks to my co-worker Antoine Zanuttini for providing me the base RenderMonkey project I used to generate the picture. The POI-based cubemap method, in the context of a forward renderer, requires an efficient way of blending multiple cubemaps (including mipmaps). When dealing with multiple cubemaps, it can be costly to blend them inside the objects shader (And even more when dealing with parallax-corrected cubemap as explain at the end of this post). 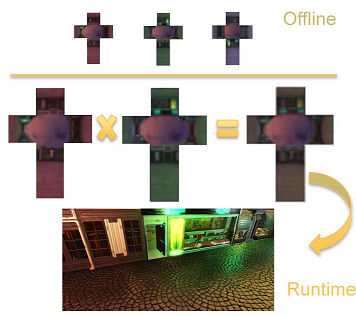 Instead, we chose to blend cubemaps on CPU or GPU separately in a step before the main rendering. In this section, I will describe a pseudo DX9 implementation method to efficiently blend multiple cubemaps on GPU. For more real usage case, the code comes with the HDR cubemap format I use. This allows seeing the performance linked to this particular format. // No alpha blending, no depth tests or writes, no stencil tests or writes, no backface culling. // Get direction from cube texel for a given face. x and y are in the [-1, 1] range. // Set direction according to face. FACEIDX is a define set to the current face to blend, each different value mean a different shader. MaxPixelColorX are the constant use to decompresses HDR cubemap after the hardware decompress the sRGB value. Note the divide by 8 (which is the constant MAX_HDR_CUBEMAP_INTENSITY) at the end of the shader. To save instruction I just divide by the max range allowed and the result is store in RGBA8 (But you can use the max of all MaxPixelColor for more accuracy). So when using the result of the blending in other shader, the MaxPixelColor must be set to 8. MipmapIndex is the current blended mipmap . // We need to transform VPOS in [-1, 1] range on X and Y axis. Here is tab showing the performance you can get with this method on PS3 and XBOX360. It requires the knowledge of the hardware layout on PS3 that I can’t detail here. The result is the same. Also, even if it look more simpler, the performance for one cubemap are the same but when using several cubemap, it is faster to use the previous method on PS3. So it depends on the context/platform. As said in the first section, a cubemap represent an infinite box by definition. When used as a local cubemap, there is parallax issue (Reflected objects are not at the right position). This section explain some techniques that can be used to correct the parallax issue of a local cubemaps to better match the reflected objects placement. The common point of every parallax-correction techniques is to define an approximation of the geometry (we will call this geometry proxy) surrounding the local cubemap. The simpler is the approximation, the more efficient will be the algorithm at the price of accuracy. Example of geometry proxy are sphere volume , box volume  or cube depth buffer . Here is an example of a cubemap with an associated box volume in white. In the shader, we perform an intersection between the reflection vector and the geometry proxy. This intersection is then use to correct the original reflection vector to a new direction. As the interaction must be performing in the shader, you can see how performance is linked to the choice of geometry proxy. 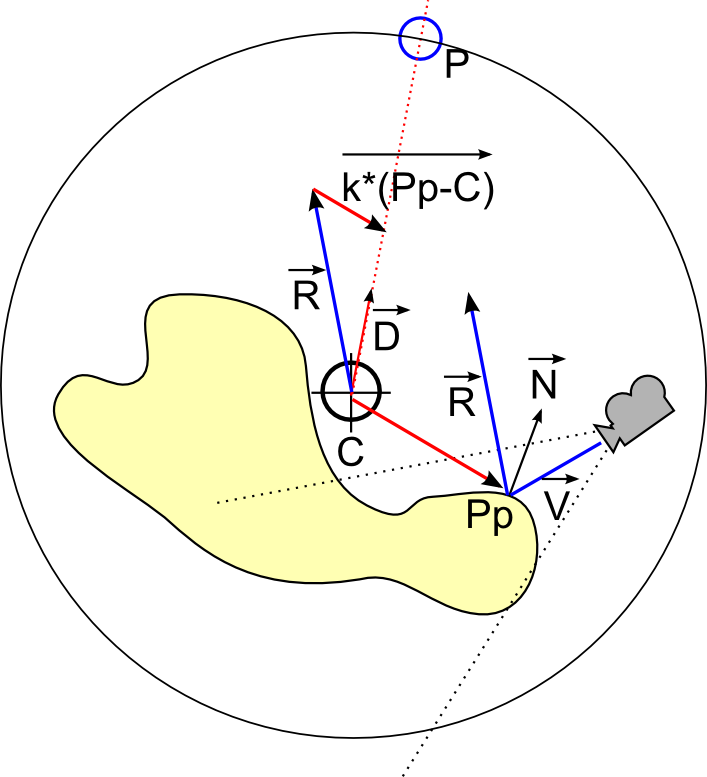 The hatched line is the reflecting ground and the yellow shape is the environment geometry. A cubemap has been generated at position C. A camera is looking at the ground. The view vector reflected by the surface normal R is normally used to sample the cubemap. Artists define an approximation of the geometry surrounding the cubemap using a box volume. This is the black rectangle in the figure. It should be noted that the box center doesn’t need to match the cubemap center. We then find P, the intersection between vector R and the box volume. We use vector CP as a new reflection vector R’ to sample the cubemap. For an example with a sphere refer to . Cheaper tricks exist to have a parallax effect. Also it requires tuning. It has been describe in   and is also use in  and seems originated from Advanced Renderman book publish in 2000. In the same spirit, Kill zone 2/3 use offset when sampling cubemap in order to change the “size” of the cubemap displayed inside an object . I will now apply the result of the two previous sections with my POI-based approach. 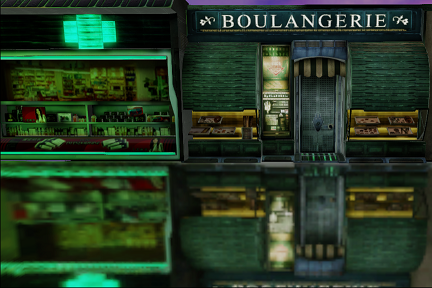 This is what I call : Local IBL approach with parallax-corrected cubemap. This approach has been develop by both me and my co-worker Antoine Zanuttini. 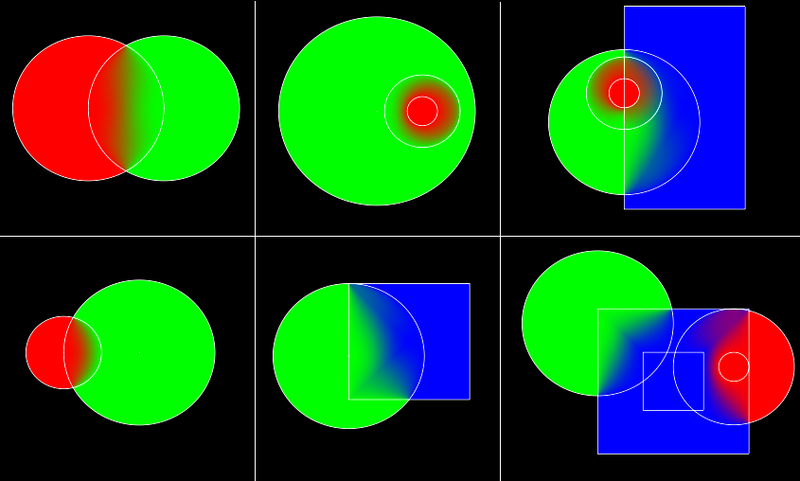 The left figure represent our previous case of a simple box as geometry proxy for the parallax correction. 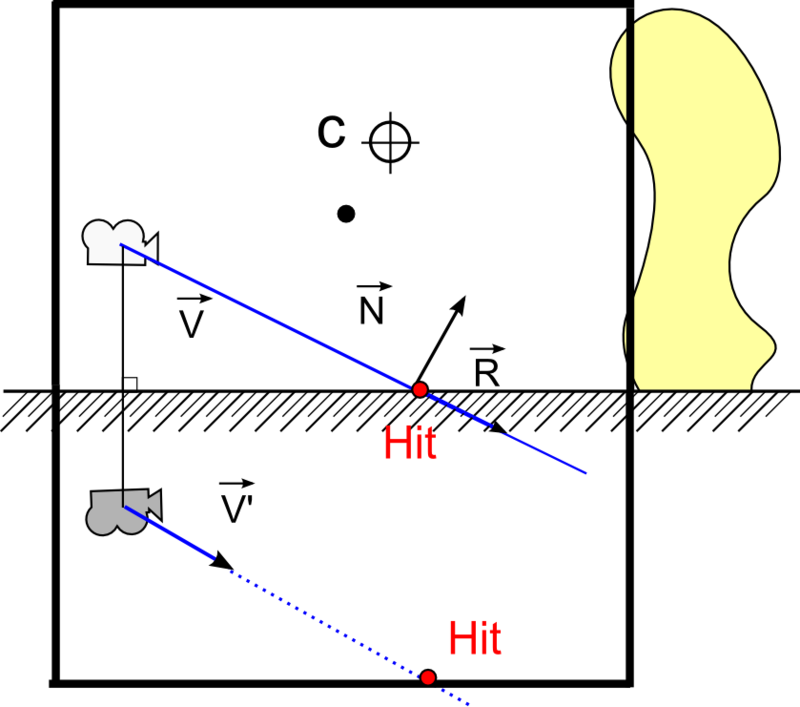 What we observe, on the middle figure, if we add the view vector of the reflected camera V’ is that it matches the reflected view vector R. We can see that both vectors V’ and R intersect the same point P. This point P could be used like before to get a new reflection vector R’ to sample a cubemap. Right figure is the result of applying this reasoning to each view direction of a cubemap. We are now able to parallax-correct the whole cubemap without requiring any pixel position. We just require a reflection plane which substitute to the pixel position. However this will restrict our parallax-correction approach to planar objects. As in the “Efficient GPU cubemap blending” section we have an alternative way to get the same result. An alternative to this code is to render the box geometry proxy (instead of the infinite box) from the 6 views of the resulting cubemap from the point of view of the reflected camera (instead of the origin). Each cubemap are additively blended with their corresponding weight. But in this case we can do even better. Why limit ourselves to render in a box. With rasterization we can throw out the limitation on the shape and can start to handle convex volume! Concave volumes still have artifacts due to hidden features. For this, we allow our artists to define BSP geometry (with a brush tools in an editor for sample), and convert the bsp to triangle. Then render this triangle list instead of the simple box. And here is the code to perform the parallax-correction for a convex volume. Shader code is for one face of the cubemap. Note that even if we use a bsp as geometry proxy for the parallax correction, we still use simple box or sphere as influence volume to not overload the gathering cubemap algorithm. – Perform the mixing step on the GPU with the convex parallax-correction blending code just above. – Apply the result in the main pass as usual. The number of the second table has been obtain by subtracting the cost of the parallax-correction shader with the original shader. Reading this result require some explanation. 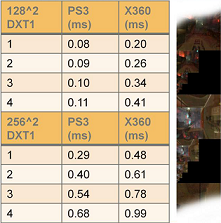 With the per pixel correction (i.e the second table), the result are depending on the screen coverage of the scene object. For 25% screen coverage each new cubemaps to mix is around 0.25ms and for 75% it is around 0.75ms on PS3. This is to compare to the mixing step approach where an additional cubemaps is only 0.08ms. It can be observe that for the per pixel correction, the XBOX perform better with one cubemap but drop more quickly by increasing the number of cubemaps. To sum up, our mixing approach better scale with many cubemaps. Moreover, with glossy material, we introduce a distortion compared to the true result. The effect increases with the angle between the reflection plane normal and the perturbed normal. The source of this distortion is due to the way we generate our parallax-corrected cubemap. With our algorithm, the parallax-corrected cubemap is valid only for pixels with normals perpendicular to the reflection plane. On the left figure several different intersections are calculated for different camera views. The entire ground surface has the same normal perpendicular to the reflection plane. On the right figure, we take the example of a single position and perturb its normal in different directions. In this case, the camera position needs to be moved. Our previous parallax-corrected camera is not able to provide the correct value in this case. We could generate a parallax-correct cubemap for this position for every possible normal but the result will be wrong for other positions. Very cool and deep analysis! Great post! 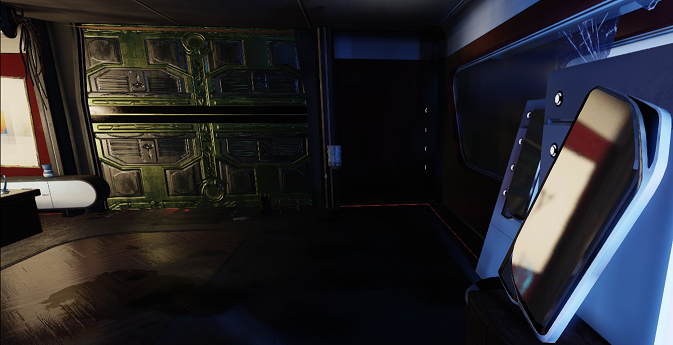 Yes, for Prey 2 I use zone based. I cross fade over a short time whenever the selection changes. The artists much preferred object based that I was doing before but applying the cubemap full screen deferred was too large of an optimization to ignore so I had to switch to a single cubemap applied to everything. It did solve the seam problem which was a nice benefit but that wasn’t the reason for the switch. I did flirt with applying cubemaps with deferred volumes but I couldn’t make it fast enough to work out. The idea there to use a normal lerping blend instead of an additive like you would with lights. That way you guarantee 100% environment map contribution so long as there is at least one volume hitting everything. Eventually I got screen space reflections to work which fixed enough of the local reflection problems the artists had with the zone approach. Maybe I missed where you mention it but there are popping issues with K closest and inverse squared contributions. When the smallest contributing cubemap switches there will be a small pop since it’s contribution only goes to zero if outside it’s range. If there are more than K in range you will get small pops. I had this very problem with my SH weighting. Thank you for these informations! I myself switch from object-based to camera-based to solve the seam problem. I try to fix the seam between object in object-based approach by modulating cubemap sample with lightmap texel (the ambient diffuse) but it was not a good solution for me. I update the post with your feedback, thanks a lot. Do you mean that you use normalized cubemap modulate by lightmap at low gloss and the color cubemap at high gloss ? I mean that with low gloss it uses the color of the lightmap * intensity of cubemap. High gloss is the reverse, intensity of lightmap * color of cubemap. 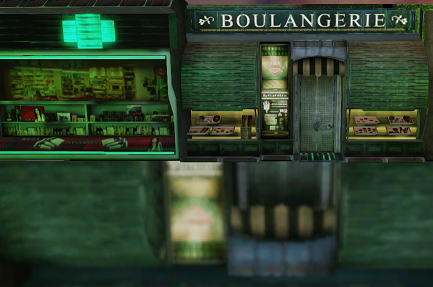 Both cases use a normalized cubemap and modulate so the average intensity is really just from the lightmap. The cubemap is giving it “texture”. This trick allows colored local lighting in low gloss and colored reflected objects in high gloss. Little update in the “Specular cubemaps memory footprint” section. Changing from compressing 3 channel with 3 individual maximun to one maximun. It’s really clever that technique you have there, and it really can replace dynamic flat reflections in many cases. I have been trying to add this effect to unity(trying to speed up our game), and the axis aligned version is working fine. However, it would be best to get the obb version going. So, I had to change the Unitary value to half the box size, with (1,1,1) it looked very off, like a pinched reflection in a small cube. Also, I was unsure of your value “RayWS”. The definition of this was not in your example further up. 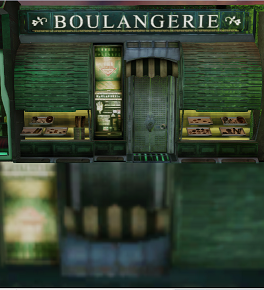 So I just used the normalized reflection direction. So, the unity surface shader above “works”, except that the top reflection is pinched to a point. But it does get rotated correctly. You spot an error in the code on this page, RayWS is ReflDirectionWS as you write. if _World2Object include the scaling of the box, you must perform the intersection with unitary box and that should work (Just in case, non uniform scaling require a through inverse matrix code). Really awesome work you did there. However I’m having some issues understanding how this reflected camera vector is obtained. Do I use a constant mirror plane normal (0, 1, 0) ? And this is my camera position that I mirror ? Which “reflected camera vector” are you referring too ? I suppose you talk about the technique regarding convex volume where you need to specify a ground plane. In this case you reflect the camera position through this plane. This code is exactly the same than any mirror plane rendering. We’ve been using this box projection technique for some time in our title. We were surprised to find some cases where it would break down. What would happen is when it picks the smallest distance out of the “FurthestDistance” float3, it would pick a negative distance. This would introduce a harsh, erroneous line across the reflection where it picked the negative distance from the wrong axis. On screen it would turn the reflection 90 degrees in one of the axes. Putting in some simple code to replace the min operations with some code that would only take the minimum of the positive distances fixed the issue – negative distances were simply ignored. The image then looked correct. Is this an issue you have encountered? Are you applying localized cubemap in forward or in deferred ? which happen only if the start point is outside the box, mean you may have no intersection. I have not encouter the issue you mention with the turn of reflection 90 degrees on one axes.